Taking a break from the busy legislative season, US Sen. Rand Paul (R-Kentucky) had a field day on Twitter, roasting President Donald Trump, Lindsey Graham and John Bolton among others. Paul, who, like other lawmakers, headed home for the holidays amid an ongoing partial government shutdown, has been using his spare time to make jabs at a few “people in Washington,” sparing neither fellow senator, Trump advisor, nor the president himself. 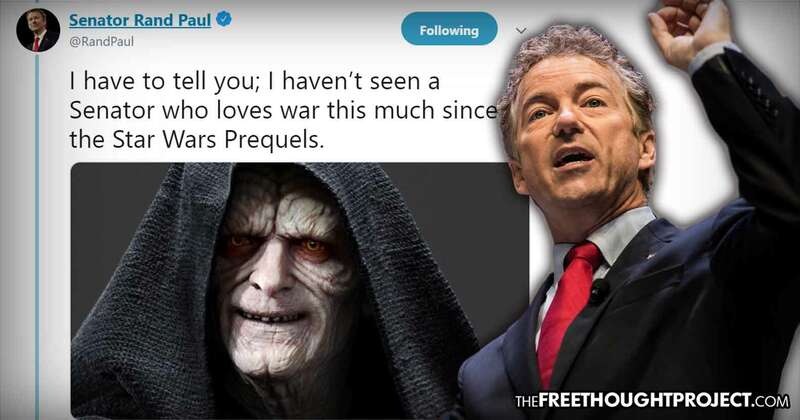 Paul, who has praised Trump’s decision to pull troops out of Syria, tore into the warmongering ways of National Security Adviser John Bolton and Senator Lindsey Graham (R-South Carolina) – even comparing the latter to Star Wars arch-villain Palpatine (who, coincidentally, was a galactic Senator before becoming the dark Emperor). Paul pitied Graham for being forced to witness American troop numbers in the Middle East dwindle and thus having to make do with the several other wars the US is still in. Taking aim at Bolton, Paul tweeted that he would be delighted to see his face when Trump told him about his decision to leave Syria. At this rate, Bolton’s White House stay might just be the opposite of what he had bargained for – and Paul is totally OK with that. Showing himself to be a merciful winner, Paul promised to “go a bit easier” on the war advocates this year. Paul said he “honestly” likes Trump, and even shared advice on how to mitigate some of the president’s downsides – such as Trump’s inability to keep staff around. Paul praised one of the few people who’ve managed to hold on for a respectable amount of time: budget director, acting chief of staff and self-confessed “right-wing nut job” Mick Mulvaney. Paul called Mulvaney “a good friend” who had served on Paul’s own presidential campaign –probably not the best example to bring up, the senator admitted. Paul joked that his long phone calls with the President had not contributed in the least toward the justice reform he supports, highlighting Trump’s notorious inability to listen to anyone but himself. Trump’s son-in-law and Middle Eastern policy adviser, Jared Kushner, tasked with finding a solution to the Palestinian-Israeli deadlock, earned a comparison with the son of Satan from a 1976 supernatural horror classic. Not the best candidate to lead a peace process, according to Paul. Sen. Ted Cruz (R-Texas) tripped over his newly-grown beard when he tried to escape Paul’s jests. The Festivus “Airing of grievances”, which comes from a fictional holiday created by author Daniel O’Keefe and popularized by the famous “The Strike” episode of the TV show Seinfeld, has become an annual tradition for Paul. Festivus is celebrated as an alternative to and in protest of the commercialized Christmas holidays on December 23.